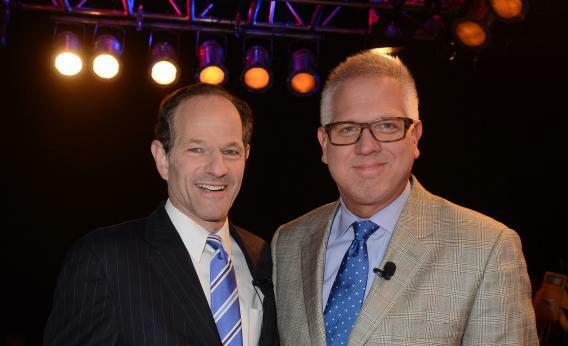 Eliot Spitzer, left, and Glenn Beck pose for a photo during Dish Network War of the Words press conference on Sept. 13, 2012, in New York City. Eliot Spitzer becomes the first Slate columnist since 2010 (when Mickey Kaus challenged Barbara Boxer) to run for office. He’s “asking for forgiveness,” and hoping to get 3,750 voter signatures in three days to make the ballot as a candidate for New York City comptroller. Why didn’t he announce this on, say, Wednesday, and use a long holiday weekend to gather the signatures? An excellent question. Ben Jacobs is out with a 2016 Iowa caucuses primer. Yes, out with it now. In July 2013. Eric Lichtblau has the goods on the FISA court’s home-brewed corpus of laws. John Stanton profiles FISA judge Reggie Walton, who doesn’t sit for an interview. Bruce Bartlett takes on the GOP’s current crisis. Not that last crisis—the other crises. Jon Marcus cites a Harvard study to explain why Anthony Weiner lied so brazenly. And Mos Def gets force-fed in the style of a Gitmo prisoner.